Mangaluru, June 12 2018: With earth caving in on the track between Kadagaravalli and Yedakumari railway stations on Shiradi Ghat, train services between Mangaluru and Bengaluru were affected. 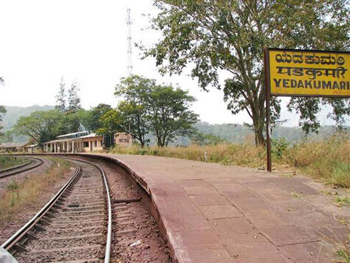 Train No 16516 Karwar-Yeshwanthpur tri-weekly express, which was scheduled to run today June 12, Tuesday from Karwar to Bengaluru, would not operate between Karwar and Mangaluru Junction as its pairing train [No 16515] was terminated at Hassan on June 11, Monday. A release from Southern Railway’s Palakkad Division here said that landslips affected regular movement of trains on the sector. Train No 16515 Yeshwanthpur-Mangaluru Junction-Karwar tri-weekly express, which had left Yeshwantpur in the morning, was terminated at Hassan. South Western Railway arranged buses to ferry passengers to their destinations, according to another communique. Southern Railway is yet to confirm operation of Train No 16516 between Mangaluru Junction and Yeshwantpur on Tuesday as it would be known only after the arrival of Train No 16515, which was terminated at Hassan on Monday, at Mangaluru Junction. Meanwhile, Train No 16576 Mangaluru Junction-Yeshwanthpur tri-weekly Gomateshwara express was diverted to run via Kannur, Palakkad Junction, Coimbatore, Erode and Jolarpettai on Monday. As the track was not cleared by Monday evening, Train No 16512/16514 Kannur/Karwar-KSR Bengaluru via Kunigal leaving Mangaluru Junction as well as Train No 16517/16523 KSR Bengaluru-Kannur/Karwar express via Mysuru leaving Bengaluru on June 11, Monday night are being diverted via Kannur, Palakkad Junction and Salem. The picture visible in window has no connection with the news item??? ?